West Addition (1973). Architect: Coburn and Sheldon, Lutes and Amundsen. As described in Style & Vernacular (below): "The quiet elegance of the original building is a good foil to the exuberant addition with its skylighted, promenade ramp and lively detailing...The diagonal path under the building forms a gateway linking the active central campus with the interior residence lawns to the south and east." 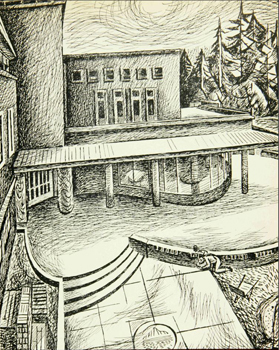 Amphitheater (1998). Landscape Architect: Cameron McCarthy Gilbert & Scheibe. Project Planner: Fred Tepfer. Manager: Garry Fritz. Initiated by ASUO to commemorate that organization's 100th anniversary, this project created an amphitheater and stage. Its design involved strong involvement with user groups of students, faculty, and staff. The 'free speech plaza' was long envisioned as part of the EMU's features and this project restored that concept which alterations after the 1950 original design impeded. Ellis Lawrence Building Survey. v.2 (Eugene). Compiled by the Historic Preservation Program, School of Architecture and Allied Arts, University of Oregon ; project directors, Michael Shellenbarger, Kimberly Lakin. [Salem, Or.] : State Historic Preservation Office, . "Erb Memorial Union." in Style and Vernacular: A Guide to the Architecture of Lane County, Oregon. Portland: Western Imprints, 1983, p. 51. McMillan, Adell. A Common Ground: Erb Memorial Union 1950-2000, University of Oregon. Eugene, Or. : Xlibris Corporation, c2003. "Fulfillment of an Oregon Dream [Erb Memorial Union]." Old Oregon 32 no.1 (Oct. 1950): 3, ill.; portrait. "The Erb Memorial Union Is Dedicated [Nov. 3, 1950]." Old Oregon 32 no.2 (Dec. 1950): 22, ill. Frye, Bill. "Let's Look Inside the Student Union." Old Oregon 32 no.2 (Dec. 1950): 18-21. MacGregor, John. "The Student Union Story." Old Oregon 32 no.2 (Dec. 1950): 18, 25. "Student Union--Hub of Campus Life." Old Oregon (Oct. 1951): 8. "State Board aids student union hopes. Project is fifth on list sent to planning commission, (Proposed)." Daily Emerald 05/02/1935, 1. "Student Union plans will be formulated in committee today. Boyer announces group to organize action for building, (Proposed.)." Daily Emerald 05/29/1935, 1. "$4000,000 for construction is possibility. PWA loan, 30 per cent, Grant necessary, says manager. $30,826.83 now available for student union", (Proposed.)." Daily Emerald 05/01/1936, 1. "Karl Onthank lauds union building project, warns against incurring debts", (Proposed)." Daily Emerald 01/19/1938, 1. "ASUO council to probe building problem. Student union action slated by committee, (proposed)." Daily Emerald 01/20/1938, 1. "ASUO annals disclose longstanding demand for student union building, (proposed)." Daily Emerald 01/28/1938, 1. "Barney Hall names board of 5 to investigate means of financing student union. Building needs here will get probe of committee; ideas for design sought, (proposed)." Daily Emerald 02/04/1938, 1. "Chairman Robbins to meet with group to discuss project this weekend, (proposed)." Daily Emerald 02/04/1938, 1. "Student union group to meet; discussion set. Committee to study construction and finance problems of projects, (proposed)." Daily Emerald 02/05/1938, 1. "Student union - Third point in a 15-year-old ASUO program, (proposed) Editorial." Daily Emerald 02/08/1938, 4. "Student union, rally reform, class voting topics of meet today", (proposed)." Daily Emerald 02/17/1938, 1. "Groundwork is laid by executive group for student union financing project, (proposed)." Daily Emerald 02/18/1938, 1. "Student union committee gets more members. Four classes now are represented in permanent body, (proposed) Portraits." Daily Emerald 10/25/1938, 1. "Dream building moves closer, (proposed) Editorial." Daily Emerald 12/02/1938, 4. "Student Union committee approves stand taken by Lane County Dads club, (proposed)." Daily Emerald 12/03/1938, 4. "Light seen through Student Union clouds as ASUO boards meet, (proposed)." Daily Emerald 04/04/1939, 1. "Gray haired alums return -- no student union building, (proposed)." Daily Emerald 04/14/1939, 3. "U.O. student union nears reality; executive committee allocates 20 per cent of $15 fee for building, (proposed)." Daily Emerald 05/09/1939, 1. "Year's progress on Student Union reviewed, (proposed)." Daily Emerald 05/19/1939, 1. "Student union on horizon; Co-op signs lease for Chapman Hall, (proposed)." Daily Emerald11/03/1939, 1. "Union hall plans begin to formulate, (proposed)." Daily Emerald01/12/1940, 4. "Webfoots go to bat for Student Union; model display today shows potentialities of proposed building." Daily Emerald 01/18/1940, 1. "Williams elected head of new freshman student union group. By Jim Banks." Daily Emerald 01/24/1940, 1. "Alumni group to aid student union." Daily Emerald 02/13/1940, 1. "Frosh members of student union group apointed.." Daily Emerald 01/28/1941, 1. "Student union boomed anew." Daily Emerald 02/05/1941, 1. "Student union's 'New Era' will start tomorrow." Daily Emerald 02/06/1941, 1. "Student union nears. Ways and means committee okays &250,000 grant." Daily Emerald 02/15/1941, 1, il..
"Student Union drive to get co-op receipts. Contributions to fill furnishing fund of new buildings." Daily Emerald 02/19/1941, 1. "Union Bill gets new ok. 'Unanimous vote' predicted by Erb; may enter today." Daily Emerald 02/21/1941, 1. "Senate passes student union finance bill. Dr. Erb predicts speed in house. By Kent Stitzer." Daily Emerald 02/22/1941, 1. "Advertising honorary makes $100 donation to student building." Daily Emerald 02/28/1941, 1. "Receipts provide furnish funds for student union." Daily Emerald 09/26/1941, 3. "Student union picks leaders." Daily Emerald 01/27/1942, 7. "After the bombs, still number one." Daily Emerald 04/11/1942, 5, il..
"Student Union drive will march again." Daily Emerald 10/30/1942, 1. "Monetary Foundation... (Susan Campbell girls donated $50 in war bonds.)." Daily Emerald 01/12/1943, 8. "Building fund available. Summary of union funds." Daily Emerald 11/20/1943, 3. "President's statement: (President Donald M. Erb)." Daily Emerald 11/20/1943, 2. "Univeristy of Oregon looks to postwar. Peacetime plans make student union building necessity on campus. By Ann Leo and Marjorie Major." Daily Emerald 11/20/1943, 1. "Progress of Union drive in review." Daily Emerald 11/20/1943, 1. "$10,000 donated to union fund." Daily Emerald 12/29/1943, 1. "Student union fund increased by $10,000 memorial to Taylor. (Major Tom I. Taylor) Gift made by Mr. and Mrs. George Guistina." Daily Emerald 12/30/1943, 1. "Board boosts student union. By Jean Lawrence." Daily Emerald 01/04/1944, 1. "Nine named to direct student union plans." Daily Emerald 01/28/1944, 1. "Student union plans started by newly formed committee." Daily Emerald 02/05/1944, 1. "Letters to the Editor, A communication signed by John M. MacGregor." Daily Emerald 02/10/1944, 2. "This is your question." Daily Emerald 02/10/1944, 2. "Student Union meet slated." Daily Emerald 02/15/1944, 1. "Student Union group seeks student ideas." Daily Emerald 02/18/1944, 17. "Student Union plans get rolling; class committees hear reports." Daily Emerald 03/22/1944, 1. "Social side talked at union confab, At a meeting of the sophomore Student Union committee." Daily Emerald 03/23/1944, 1. "Beauty parlors, movies, listed in union "musts." Daily Emerald 03/31/1944, 4. " Student Union plans started." Daily Emerald 04/27/1944, 1. "Union assured. State board adopts program listing $700,000 for building." Daily Emerald 05/17/1944, 1. "Erb memorial gets site, architects at board meet." Daily Emerald 08/18/1944, 1. "Gene Conklin to resign position as student union chairman; plans for building have begun." Daily Emerald 04/20/1945, 1. "Student Union plans underway. Portland firm preparing student building plans." Daily Emerald 12/01/1945, 3. "President sketches unions dim outline. Dr. Erb's "No.1" building forms no relationship with science lab. By Herb Penny." Daily Emerald 02/12/1946, 1. "Initial step toward student union taken Monday by activities board. Group appoints budget members; Samain named Oregana business head." Daily Emerald 02/13/1946, 1. "Student union drive planned." Daily Emerald 02/15/1946, 1. "Bond issue, contributions of breakage fees, to help construct $1,100,000 student union." Daily Emerald 05/31/1946, 1. "Student Union plans started." Daily Emerald 09/24/1946, 1. "Large enrollment aids union plans." Daily Emerald 10/11/1946, 1. "New Student Union drive aimed at million-dollar goal." Daily Emerald 10/22/1946, 6. "Unfurnished rooms, Plea for funds for furnishings." Daily Emerald 10/29/1946, 2. "New Committee formed to boost student union building campaign,"Portrait of Wally Johnson, student union chairman." Daily Emerald 11/26/1946, 1. "Painless contributions, Contribution of student breakage fee." Daily Emerald 12/03/1946, 2. "Student Union "Dream" slowly taking shape. By Conna Kletzing." Daily Emerald 01/04/1947, 1. "State board okays Student Union building plans." Daily Emerald 01/28/1947, 1. "Building committee okays plans for University of Oregon student union, Architects picture of building." Daily Emerald 01/29/1947, 1, il..
"Williams tours, studies student union buildings; describes methods of middle western areas." Daily Emerald 04/23/1947, 1. "'Best in the country" Union plans presented Union Association by University of Oregon supervising chief." Daily Emerald 04/26/1947, 1. "Series to explain floor plans for approved Student Union." Daily Emerald 05/02/1947, 1. "Food spots, Co-op, barber shop Oregon's with Student Union. By Donna Kletzing." Daily Emerald 05/03/1947, 6. "Student Union ballroom, banquet room blueprinted for ground floor." Daily Emerald 05/06/1947, 1. "Student Union second floor to house offices." Daily Emerald 05/07/1947, 1. "Roof garden, cafe to make Student Union elite." Daily Emerald 05/09/1947, 5. "No more a dream." Daily Emerald 10/29/1947, 2. "Erb memorial originators to break groud this spring." Daily Emerald 03/31/1948, 1. "The Student Union: from dream to reality, Illus. of ground breaking ceremony." Daily Emerald 06/17/1948, 3. "Final conference on building plans held." Daily Emerald 06/24/1948, 1. "Student Union plans---1924, picture of architects drawings of proposed building 1924." Daily Emerald 09/21/1948, 7. "Memorial building construction begins within next thirty days." Daily Emerald 09/21/1948, 1. "A dream nears reality." Daily Emerald 09/21/1948, 6. "Erb Memorial Union, (Revised architects drawing; supercedes illustration in September 21st issue of Emerald)." Daily Emerald 09/22/1948, 1. "Union contracts signed." Daily Emerald 10/08/1948, 1, il..
"Plan completed Union by winter term, 1950." Daily Emerald 01/19/1949, 2. "S.U. building progresses rapidly." Daily Emerald 02/03/1949, 3. "U.O. Erb Memorial dazzles; marble staircase tops all, (v. 50)." Daily Emerald 02/10/1949, 1. "Bad weather holds up construction pace on Student Union and new women's dormitory, (v. 50; illus.)." Daily Emerald 02/24/1949, 1, il..
"Williams wants help in picking café moniker, (v. 50)." Daily Emerald 04/15/1949, 8. "Completion of Erb Memorial Union to fulfill dreams of thousands, (v. 51)." Daily Emerald 12/01/1949, 6. "Circumventing the SU moat, (v. 51)." Daily Emerald 03/06/1950, 2. "Student Union opening delayed, (v. 51)." Daily Emerald 04/03/1950, 1. "Menus, soda-jerks' hats, china: all tops for Union. ", (v. 51)." Daily Emerald 04/13/1950, 3. "Student Union features complete "Fun" facilities. ", (v. 51)." Daily Emerald 04/17/1950, 6. "New SU to include facilities for culture, (v. 51)." Daily Emerald 04/20/1950, 3. "Grass to grow on SU grounds, (v. 52)." Daily Emerald 09/29/1950, 1. "Fallow fields". ", (v. 52)." Daily Emerald 11/15/1950, 3. "Landscaping of SU brought to halt, (v. 52)." Daily Emerald 11/30/1950, 3. "Oh happy day! SU flagpole up." Daily Emerald 03/23/1951, 7. "Landscaping on grounds of student union best few years from now." Daily Emerald 05/03/1951, 7. "Illustration." Daily Emerald 11/01/1951, 1. "Walls refinished in SU rooms." Daily Emerald 01/07/1953, 1. "Murals brighten SU third floor." Daily Emerald 05/11/1953, 2. "SU improvements made in summer." Daily Emerald 09/18/1953, 2. "Emerald edits bring results, ivy removed from walls." Daily Emerald 05/26/1954, 1, il..
"It's aging." Daily Emerald 02/28/1955, 2. "Large expansion program underway in Student Union." Daily Emerald 05/26/1955, 1. "SU Board sets structure policy." Daily Emerald 11/10/1966, 1. "Flemming may drop 'building'." Daily Emerald 09/29/1967, 1. "Cover approved for EMU court Cover approved for EMU court.
" Daily Emerald 01/13/1969, 3. "EMU: addition in the works." Daily Emerald 10/31/1969, 5. "Student leaders briefed on EMU addition plans." Daily Emerald 12/03/1969, 4. "Plans, priorities for EMU discussed with architect, Charles Coburn." Daily Emerald 12/11/1969, 3. "Satellite' union plans under consideration." Daily Emerald 02/02/1970, 1. "Student Union: Addition or satellite?." Daily Emerald 02/11/1970, 1. "North parking opposed the planning committee." Daily Emerald 02/27/1970, 4. "EMU addition site to be determined." Daily Emerald 10/08/1970, 4. "Architect [George Sheldon] presents model to Senate." Daily Emerald 10/14/1970, 1. "Group to show addition plans." Daily Emerald 10/14/1970, 3. "Planners approve EMU [Erb Memorial Union] addition; policy set for use of 13th closure." Daily Emerald 10/16/1970, 6. "EMU loses sculpture ['Big Red'] to unidentified." Daily Emerald 10/21/1971, 4, -. "Group to consider EMU addition plans." Daily Emerald 05/16/1972, 4. "EMU addition discussed." Daily Emerald 05/22/1972, 7. "Bids received for EMU." Daily Emerald 07/18/1972, 3. "EMU, Hayward Field delays, bike racks discussed by planners." Daily Emerald 12/05/1973, 1. "Students claim ownership: first Mac Court, and now the EMU." Daily Emerald 03/12/1976, 6. "EMU renovation won't raise food prices." Daily Emerald 01/27/1978, 3. Schiola, Emily. "The real state of the EMU; our student union is falling apart." Daily Emerald 10/8/12, 5. "How the EMU referendum became mired in controversy." Daily Emerald 10/8/12, 6-7. 10.